Also serving communities of Maugansville. There are 24 Assisted Living Facilities in the Hagerstown area, with 8 in Hagerstown and 16 nearby. The average cost of assisted living in Hagerstown is $3,439 per month. This is higher than the national median of $3,346. To help you with your search, browse the 98 reviews below for assisted living facilities in Hagerstown. On average, consumers rate assisted living in Hagerstown 3.4 out of 5 stars. Better rated regions include Williamsport with an average rating of 4.1 out of 5 stars. Caring.com has helped 5 families in Hagerstown find high-quality senior care. To speak with one of our Family Advisors about assisted living options and costs in Hagerstown, call (855) 863-8283. Beautiful scenery and a charming small-town atmosphere are only two of the reasons to love Hagerstown. The city is a gateway to the Shenandoah Valley and rests along old transportation routes near the Cumberland Gap. Seniors will notice a mix of the old and new in Hagerstown, from Civil War history to modern dining. Seniors interested in assisted living in this area can choose from eight facilities within the city and 41 in the surrounding areas. Assisted living programs (ALPs) are licensed in Maryland by the Department of Health and Mental Hygiene. The summer climate in Hagerstown is lovely, with an average high temperature of 87 degrees Fahrenheit in July. Seniors can get outside and take full advantage of the area's parks and walking trails. The winters, however, can be harsh for seniors who prefer warm climates. The city receives about 29 inches of snow each year. Seniors can benefit from Hagerstown's low cost of living. On the 100-point index, Hagerstown is 11 points lower than the U.S. average and 28 points lower than the Maryland average. A low cost of living gives seniors more options for their retirement. The crime rate in Hagerstown is higher than that of the nation and the state of Maryland. The chance of violent crime in Hagerstown is 1 in 175, and the chance of property crime is 1 in 32. The sales tax rate in Hagerstown is 6.0 percent, the same as the U.S. average. The income tax rate, at 7.6 percent, is 3.0 percent higher than the national average. While the state of Maryland does exempt some kinds of retirement income from taxation, including Social Security benefits, it fully taxes others. Maryland is also one of only two states in the nation that has both an inheritance and estate tax. The Washington County Transit Department (WCT) runs eight fixed routes throughout the area and offers a senior discount. WCT also provides rides and a voucher program for seniors with disabilities who are unable to use the fixed-route service. The Hagerstown area is home to world-class medical facilities, including Meritus Medical Center, in the event of medical emergencies or illness. Assisted Living costs in Hagerstown start around $3,439 per month on average, while the nationwide average cost of assisted living is $4,000 per month, according to the latest figures from Genworth’s Cost of Care Survey. It’s important to note that assisted living rates in Hagerstown and the surrounding suburbs can vary widely based on factors such as location, the level of care needed, apartment size and the types of amenities offered at each community. 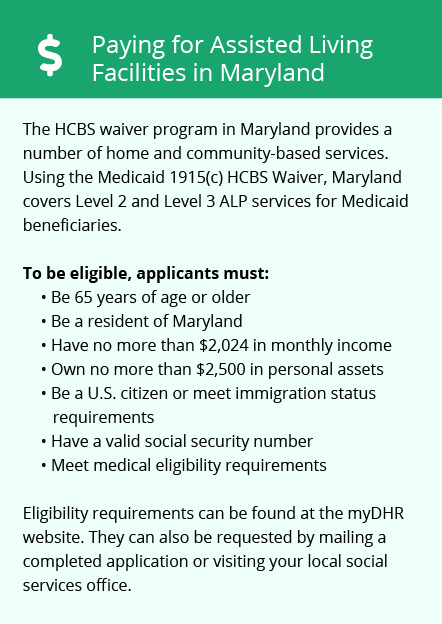 The state of Maryland covers assisted living services in Level II and Level III ALPs under the Medicaid 1915(c) Home and Community-Based Options Waiver Program. 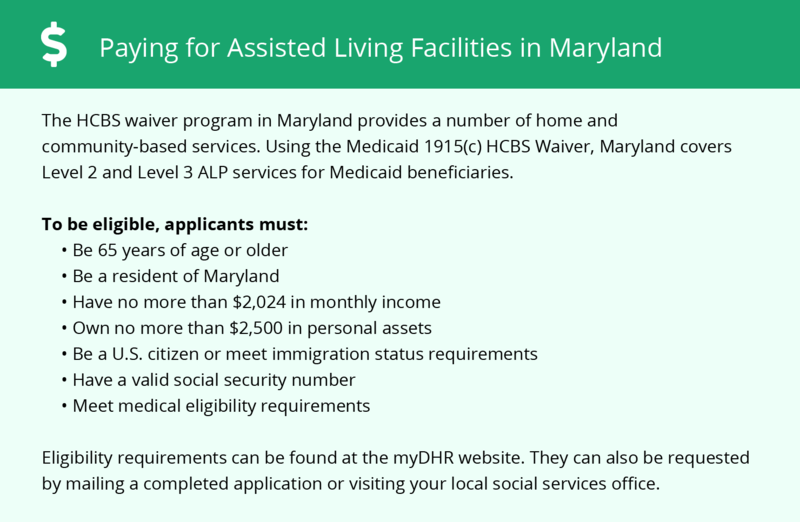 Additionally, Maryland funds the Senior Assisted Living Group Home Subsidy Program for services received in small assisted living facilities. Hagerstown and the surrounding area are home to numerous government agencies and non-profit organizations offering help for seniors searching for or currently residing in an assisted living community. These organizations can also provide assistance in a number of other eldercare services such as geriatric care management, elder law advice, estate planning, finding home care and health and wellness programs. To see a list of free assisted living resources in Hagerstown, please visit our Assisted Living in Maryland page. Hagerstown-area assisted living communities must adhere to the comprehensive set of state laws and regulations that all assisted living communities in Maryland are required to follow. Visit our Assisted Living in Maryland page for more information about these laws.